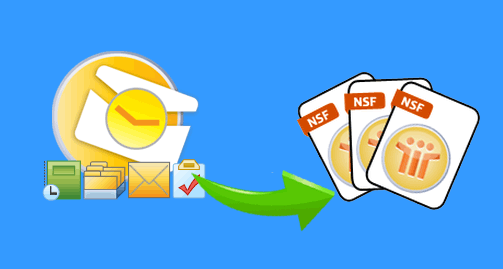 Outlook to Notes converter tool provides a one-stop solution to convert PST to NSF file format. It is capable of moving several Outlook mailboxes to NSF file format just in a single cycle. The software renders an interactive interface and the vital features of it proves itself as one of the best solution among all. The software enables users to access mailboxes of MS Outlook like emails, address book, notes, tasks, etc., in Lotus Notes email client. It preserves the entire meta properties related to messages like email header, attachment, message body, etc., without any hassle. The PST to NSF converter is programmed with an advance set of algorithms, which performs a rapid and accurate data migration of the browsed PST file into IBM Notes NSF format. It performs a safe file conversion because it has an ability to migrate data without affecting the original files. The software to export Outlook PST data to IBM Notes is the feature-rich software, which enables users to convert select items from file. This means that users can exercise their choice to filter out unwanted items. This feature is applicable only on Outlook emails, calendar, and task. The easy-to-use and understandable interface makes the entire process of migration simple while performing. The PST to NSF Converter is providing a step-by-step guidance, which requires no technical knowledge to work with it. It makes the most tedious task a simple activity and reduces the overall conversion time. In Microsoft Outlook, whenever users delete an email from the folder, it gets moved in ‘Deleted Items’ folder. Usually, they forgot to remove items from this folder, which at the end of the day rises the overall size of PST file. So, to reduce the overall conversion time, users can exclude this folder through the software feature. The Outlook PST to NSF converter requires availability of MS Outlook and IBM Notes program on the machine where tool is to be used. Well, the conversion tool is workable with all versions of MS Outlook, including 2016 and also, works with IBM Notes, including 9.0.1. Users can work with this application on Windows 10 and all below versions. Free Version: The software developers has provided interested customers with facility to test the product by downloading its trial version. This edition will permit them to export only 15 items per folder from PST to NSF format. Full Version: This is the licensed edition with no restrictions on exporting data from Outlook to IBM Notes. Like the free version, there is no limit imposed on this version of the tool, which restrict one in any case while working with it. Step 1 :Download PST to Lotus Notes Converter. Step 2 : Add Outlook Data File (.pst) in the Tool. Step 3 : Select PST items & Destination Location. Step 4 : Hit Export & start PST to NSF conversion. Will your PST to Notes converter work with corrupted files of Microsoft Outlook? No, PST to NSF file converter does not provides support to work with corrupted Outlook file. For dealing with corruption issue, you can use our Outlook recovery software, which is a tool to convert corrupted PST files into a healthy PST. After this, use our PST to NSF migration tool to convert this healthy PST in NSF file format. Does your software requires Lotus Notes environment to be installed on machine? Yes, it is mandatory to have IBM Notes and MS Outlook of any version on the machine where tool is to be installed for conversion purpose. Will your converter requires IBM Notes account credentials to work with it? No, our tool works without any requirement of MS Outlook or Lotus Notes account credentials. Only the PST file is required to attempt the conversion task with our software. Can you help me out by describing the short steps to convert PST files into NSF via tool? What is maximum Outlook data file size limit up to which I can browse file within the software? There is no file size limitation imposed in software. You can browse PST file of any size without any concern of single doubt. Can I convert multiple PST files into NSF format with help of your tool? No, the migration supports only one PST file at a time. It creates one NSF file for the Outlook file, which is browsed within it. Copyright © 2009-2019 www.convertpsttonsf.co.uk | All Rights are Reserved.